This pressure treated collection of garden products provides the discerning gardener with a range of beautifully designed garden buildings from gazebos and arbours to summerhouses and pavilions and a comprehensive range of garden products all with a common theme - quality, style and sheer good value. 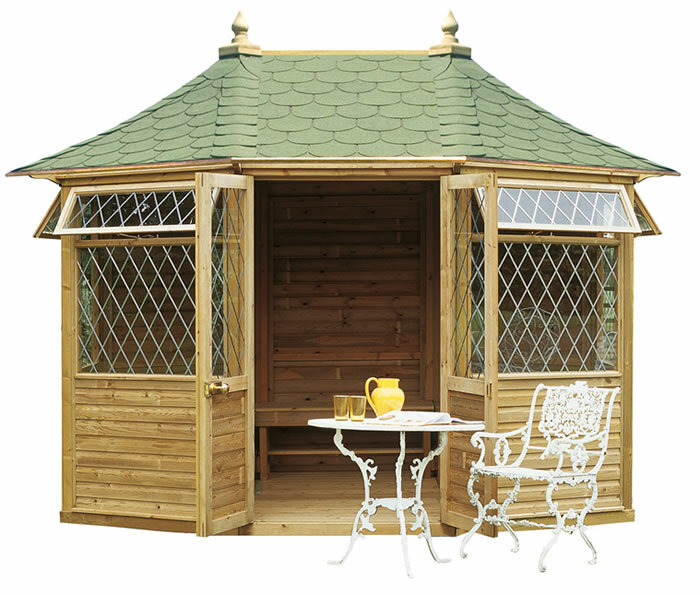 Designed to bring the classic English style of garden architecture to your garden, all these summerhouses and gazebos are manufactured from carefully selected and seasoned Scandinavian Redwood from the superbly managed forests of Northern Scandinavia. Here continuous replanting ensures excellent conservation and a guaranteed high quality supply. All of the timbers are pressure impregnated, using the most advanced formulation of permanent wood preservative. Besides providing complete protection against decay and insect attack, this treatment also contains a special wax additive, which improves the weathering performance and dimensional stability of the timber. With the minimum of aftercare, you can reasonably expect your tanalised garden building to maintain their classic good looks and have a useful life for years. In fact the wood is guaranteed on all these summerhouses and gazebos for 10 - 15 years. This is included in our prices for most areas of the UK mainland, however due to some manufacturer's policies some remote areas may incur additional charges and/or slighter longer delivery times than usual. Please check with us prior to ordering if you feel this may apply to where you live.